In a pair of statements released early Tuesday, Microsoft and Nokia announced that the two companies have entered into a mutual agreement in which the Windows Phone maker will purchase the Finnish firm's Device and Services Business, as well as license patents and mapping assets, for $7.17 billion. When the deal closes sometime in the first quarter of 2014, Microsoft is set to pay nearly $5 billion to substantially own Nokia's Device and Services business, while certain patents will be licensed for an additional $2.2 billion. According to the announcement, licensing will include Nokia's HERE mapping service. Nokia's current CEO, Stephen Elop, is also expected to step down as part of the deal. Instead, he will be Microsoft's Nokia Executive Vice President of Devices & Services. There is also talk that Elop is in the running to replace Microsoft's outgoing chief executive Steve Ballmer, though no official statements were offered on that front. The 10 year licensing agreement will allow Microsoft to use the Nokia moniker on current cellular devices and give the Redmond, Wash., company a substantial boost as it tries to keep the Windows Phone platform relevant in the face of dominant smartphone players Apple and Google. Specifically, Microsoft is acquiring over 8,500 design patents, 30,000 utility and patents pending, the Lumia and Asha brands and a 10-year license to use the Nokia brand on feature phones. 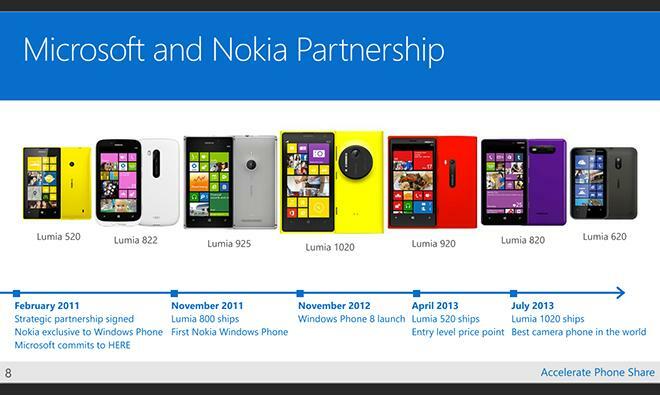 Microsoft's acquisition is somewhat reminiscent of Google's $12.5 billion purchase of Motorola in 2012. However, unlike the huge smartphone marketshare enjoyed by Google's Android, Microsoft's Windows Phone is a minor player in the segment. Market research firm Kantar on Monday estimated Microsoft's Windows Phone owned a mere 3.5 percent of the U.S. smartphone market during the July quarter, while Apple's iOS and Google's Android held a respective 43.4 percent and 51.1 percent share over the same period. Potential price adjustments protecting both companies if the deal falls through, with Microsoft specifically subject to a $750 million termination fee if the proper regulatory clearances are not received.